It’s a simple fact. Metal does not belong in food items. No matter how it might find its way there, it must be found and removed before it reaches the consumer. Meat, poultry and vegetable processors, in particular, depend on metal detectors to keep food safe. In fact, it’s a requirement. 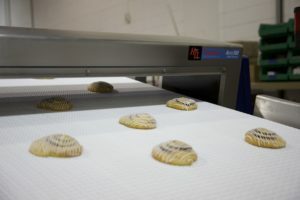 If you are starting up a food processing line or expanding an existing line, here are some tips on integrating a metal detector onto your conveyor system. Metal detectors are mounted on a section of a conveyor (usually 6’ to 12’ long). They need to be this long because there must be a metal-free zone before, after and around the detection head. Otherwise, the device may be activated by the frame of the conveyor. Seamless transitions at each end allow your product to flow smoothly. You will need to set aside enough room in your facility to accommodate this conveyor segment. Metal conveyor belts will also set off the metal detector. Belts should be made of non-ferrous material such as modular plastic, fabric or urethane. Obviously, in food processing applications, belts need to be simple to clean or wash down. Depending on your specific application, we can make a recommendation on what would work best. The sensitivity of each metal detector actually decreases as its aperture (opening) size increases. For accurate metal detection, the aperture of the metal detector head should be selected based on the specific product size. To remove a contaminated product from the line, many rejection options are available. The simplest method is a belt stop and alarm (audible and visual) that alerts the operator to isolate and remove the suspected product. While this is the most economical option, it also causes delays on the line. Automated options can be integrated into the design instead to keep your line running smoothly. Lighter weight items can be blown off the belt with an air blast. Bulkier object can be removed with flap gates, retracting ends, push arms, or slide gates. All these methods push the object off the conveyor or drop it below. To ensure that a rejected product does not find its way back into the production line for any reason, lockable reject bins are becoming increasingly popular. These bins collect the rejected products and hold them until a quality assurance operator can re-inspect or dispose of them safely. 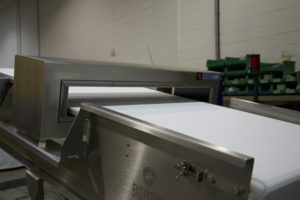 If you need a custom metal detector conveyor configuration, or just need a metal detector integrated into your current food line, we would be happy to discuss your unique requirements. 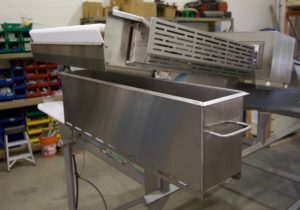 Our engineers and designers can build a custom conveyor around the metal detector head of your choice, working with the manufacturer to get exact specs and drawings for a seamless fit and install. If you would like more information about seamlessly integrating a metal detector to your line, please contact us.